William H. Kriss, 66 of Chesapeake, VA passed away on April 5, 2019. William “Billy” Kriss is the beloved brother to James Kriss and wife Toni Kriss. William was predeceased by his brother, Glenn Kriss and sister, Nicole Walsh. William is the son of the late Henry and Franziska Kriss, and beloved uncle to Jordan Kriss, Kendall Kriss Brendan Walsh and Chelsea Walsh Greschak (Matt). William will be missed by his many relatives in Germany and his brother in law, Joe Walsh. 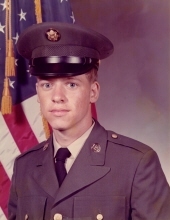 William was a 1970 graduate of Great Bridge High School, earned a Bachelor’s Degree from Old Dominion University and was a Veteran of the U.S. Army. He was a great fan of all sports and enjoyed golfing. He also enjoyed soccer and coaching local community teams. William was soft spoken, had a pleasant demeanor and wonderful sense of humor. A memorial service will be conducted at 6:00 pm, Tuesday April 9, 2019 at Oman Funeral Home & Crematory Great Bridge Chapel. Friends are invited to share memories and sign the online guestbook at www.omanfh.com. To send flowers or a remembrance gift to the family of William Henry Kriss, please visit our Tribute Store. "Email Address" would like to share the life celebration of William Henry Kriss. Click on the "link" to go to share a favorite memory or leave a condolence message for the family.